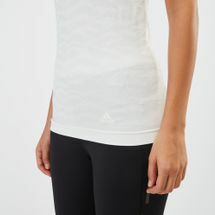 Enjoy seamless comfort every time you slip on the adidas Ultra Primeknit Parley Tank Top for women. The feel-good smoothness and loose fit helps you to breeze through your daily runs while the deep armholes reduce rub while you move and stretch. Mesh inserts keep breathability in check.